Blackhawks and Cubbies and Bears, OH MY! Even through the dog days of summer, the sports keep going and, as Sonny and Cher once said, the beat goes on. Even though we are in the off seasons of most sports, there is still a lot of news coming down the pipes about our favorite sports teams. The post-2013 season has the Blackhawks focusing on adjusting to a new roster and being recruited to represent their home countries at the 2014 Winter Olympics in Sochi, Russia. Team Canada has recruited Duncan Keith, Brent Seabrook, Jonathan Toews, Patrick Sharp, and Corey Crawford. Team USA has brought Nick Leddy, Brandon Saad, and sharp-shooter Patrick Kane to their team. 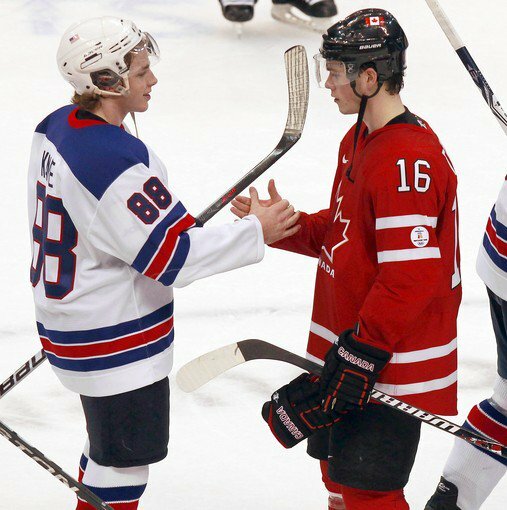 In 2010 it came down to Kane vs. Toews for the gold and America went home with the silver medal. With this many Blackhawks skating to Russia in 2014, Chicago hockey fans will find a lot to scream at their television about as it will be difficult to root against either team with so many revered players pitted against each other for Olympic Gold. Congratulations to all of the Blackhawks chosen for the 2014 Winter Olympic games! The Bulls, and all of Chicago, are preparing for the much-awaited comeback of superstar Derrick Rose. His manager and brother, Reggie Rose, has been talking with the press about Rose’s recovery and says that Rose is ready to go. Reggie Rose says that he has “no concerns about [Derrick Rose] physically” and that taking a year off may have hurt the Bulls, but it was necessary for the longevity of his career. He believes “Derrick should probably be able to play fifteen to eighteen years,” so taking a year off was a means of making sure he was physically prepared to play basketball for the next two decades. The return of Rose is great news for Bulls fans, but sending Nate Robinson to the Denver Nuggets is definitely terrible news for Bulls fans as the heart of the 2013 playoffs is now someone we face instead of someone helping us block Lebron’s shots. We’re gonna miss you, buddy. So, with the return of Derrick Rose, the departure of Nate Robinson, and the shaky status of Luol Deng’s contract extension, what does the 2014 Chicago Bulls roster look like? The point guards look sharp with Derrick Rose, Kirk Hinrich, and Marquis Teague hitting the court. Rose’s return, if successful, will be a major boost for the Bulls, obviously. The skill and talent of Rose will be a great punch on the court; what will really stand out is that the heart and spirit of the team–both for the team and for the fans–is returning to the United Center. After a year and a half of anticipation, wondering down to the last game against the Miami Heat in the 2013 playoffs if Rose would make a miraculous return, the bright comet of the Chicago Bulls will blaze down the court again and set the competition ablaze. Our shooting guards and shooting forwards are looking sharp. Jimmy Butler is in need of some polish, but there is plenty of time to make sure that he is in the best condition to hit the court. Mike Dunleavy will serve as a secret weapon for the Bulls as the opposition will be on guard against the dynamite talent of Derrick Rose which will keep their eye distracted from the three-point power of Dunleavy. 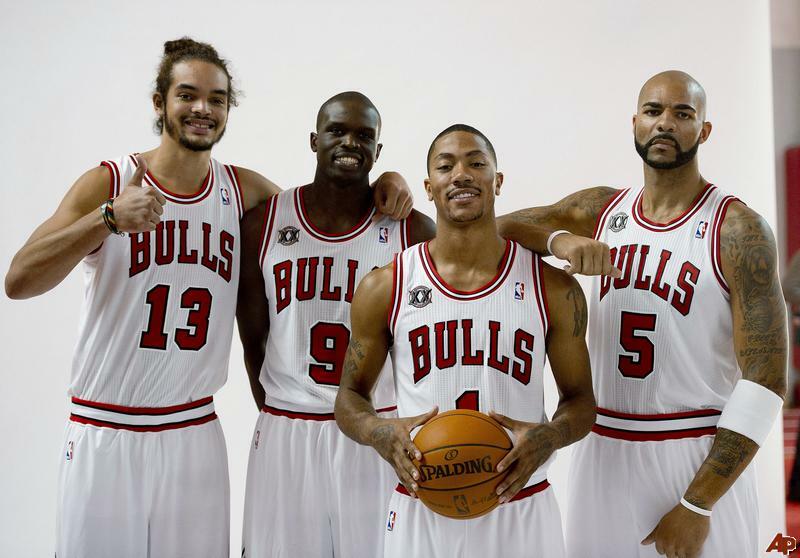 Power forwards Carlos Boozer, Taj Gibson, Malcom Thomas, and Erik Murphy are focused but in need of strengthening. Carlos Boozer is the 2014 Bulls’ Scottie Pippen, reliable with strong offense, but his defense needs a lot of work. Taj Gibson, on the other hand, brings a great defensive game. If the two could learn from each other, we would have two stunning power forwards on the court. 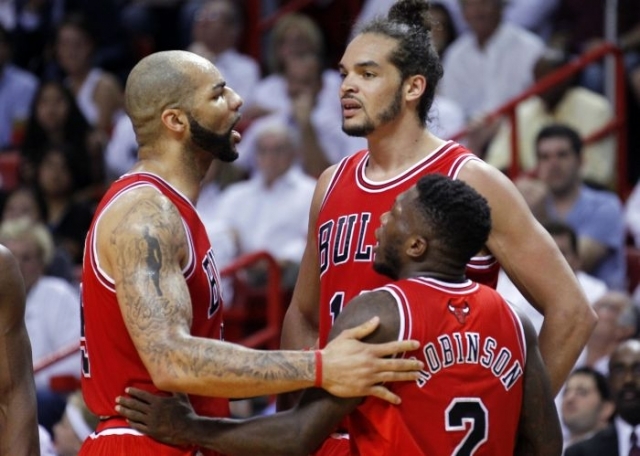 Boozer’s on court relationship with Noah creates spectacular offense as well; they are a threat just like Pippen and Jordan when they hit the court together. Centers Joakim Noah and Nazr Mohammad round out the roster. Joakim Noah is the Bulls offense and does well adapting to the style of his teammates while remaining determined and focused. Mohammad does his job well with decent defense and use of fouls, but he is not good in long play. If Noah’s annual injuries flare up again, Mohammad will have big shoes to fill on the court as he is simply not on Noah’s level yet. The Bulls roster looks good, and they’ve proven that they can play without Rose. 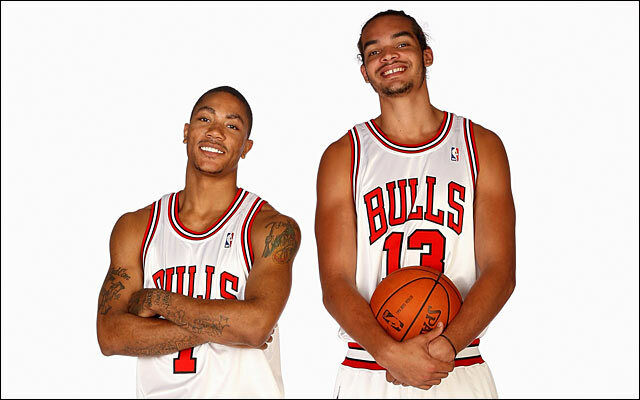 This year should provide us with amazing basketball as the return of Rose will only boost the ability of the already spectacular Chicago Bulls. Basketball Biology 101: This is a heart. 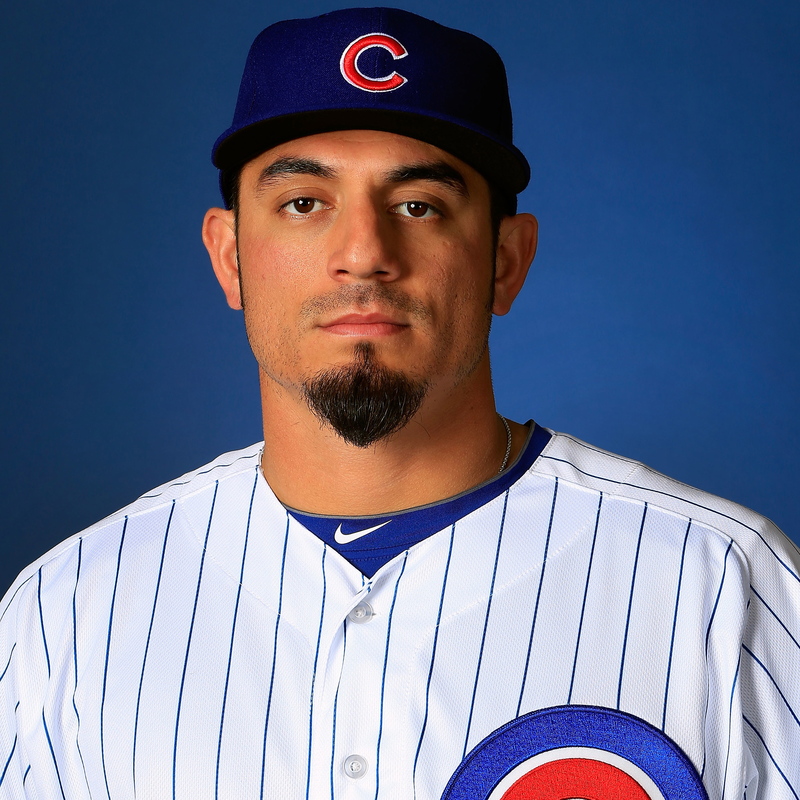 After many rumors and a lot of talks, the Cubs have traded Matt Garza to the Texas Rangers. In return the Cubs are getting third baseman Mike Ott and two right-handed pitchers, C.J. Edwards and Justin Grimm. The trade agreement also allows for the Cubs to acquire up to two more pitchers, possibly Neil Ramirez. This is proof that the Cubs are serious about rebuilding. It stands to reason that the Cubs are looking to build a good team that is could possibly begin winning because with all of the talk about revamping Wrigley Field, they should have a team good enough to draw fans into the expensive stadium. This also shows the Cubs are shifting away from keeping fan favorites and abandoning player loyalty and looking to rebuild a functioning baseball team that stands a chance to make the playoffs in the coming years. BREAKING: If you keep eating that towel, you will not be hungry for lunch! The Bears begin training camp on Thursday! Preseason football will be hitting our television screens in a matter of weeks. 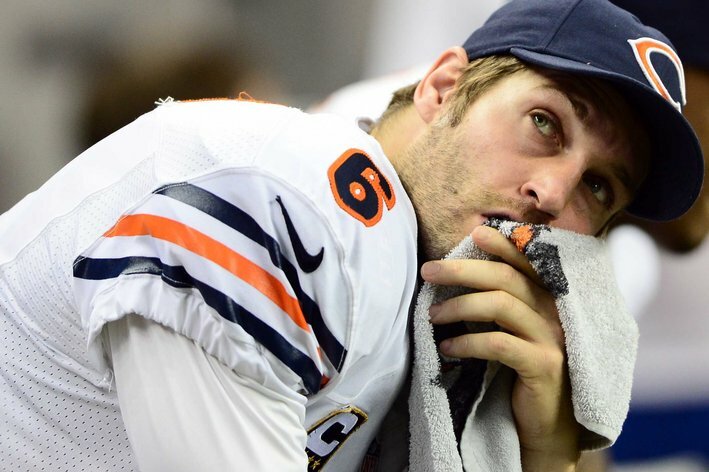 Hopefully the Bears will be taking this time to strengthen their offensive line and forcing Jay Cutler to step up his game in order to get the Bears into the playoffs this season. Chicago is hungry for another major sports victory, and the Bears have the talent and the drive to make it happen. Olympians, returned superstars, new players, and new goals; the world of Chicago sports is spinning into very interesting areas. As these sports get revved up and ready to go, remember that one very important event happening this year is the retirement of Mike Ditka’s number in January. 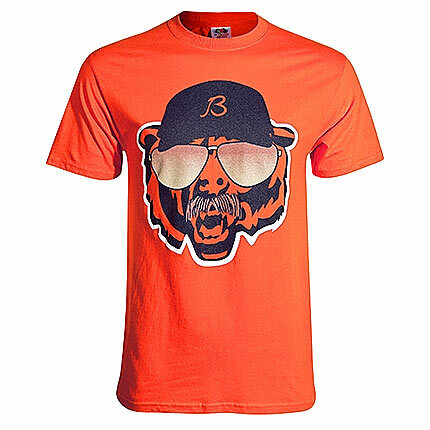 Get ready for this monumental year of football and festivities with our Mike Ditka Chicago Bear tee shirt (http://tinyurl.com/oht723e). Grab great sports threads from Clark Street Sports so you can be ready for all of the exciting things happening in Chicago sports! The Cubs Home Opener at Wrigley Field is 3 weeks from today as the Chicago Cubs will host the Milwaukee Brewers at 1:20 on Monday, April 8, 2013. The start of the 2013 baseball season will mark the 99th Anniversary of the Cubs Historic Ballpark and Clark Street Sports has all your favorite Cubs and Wrigley Field merchandise throughout the 2013 baseball season. Cubs fans, remember to pickup all your favorite Cubs and Wrigley Field Merchandise at Wrigley Field before the start of the 2013 Baseball Season. Clark Street Sports Joliet Location 3340 Mall Loop Dr. Joliet, IL. For all those who don’t know, Summer on Southport is a 2-Day Festival (July 22 and 23) that includes entertainment in a variety of ways: culinary, visuals, and performing arts. The Festival is located on the 3700 Block of N. Southport Ave. (or less than a mile from Wrigley Field) and features quality entertainment, food, and shopping throughout. Furthermore, since Southport Avenue is seen as one of the city’s top shopping and nightlife districts, we feel it’s an ideal time for the people of Chicago to purchase merchandise of their hometown teams while being around town. At Clark Street Sports, we not only specialize in selling merchandise of your favorite Chicago teams, we additionally have a number of Chicago themed products that help show-off our beautiful city. At Clark Street Sports, we sell the best Chicago and Summer products around.